I wheeled to a stop behind a park bench that was flooded with sun. Before me, beyond the treetops and a clifflike drop, container ships lay at anchor, waiting to float our grain to foreign climes. A ferry’s wake tickled a few sailboats, which bobbed in response. From my vantage point on Magnolia Boulevard unfolded a perfect Seattle day, arrived at by bike. Bicycle outings don’t all have to be purposeful rides or arduous workouts. Sometimes it’s enough to be lazing on a Sunday afternoon on your bike, meandering down a shady lane, perhaps stopping for a short walk or a picnic. 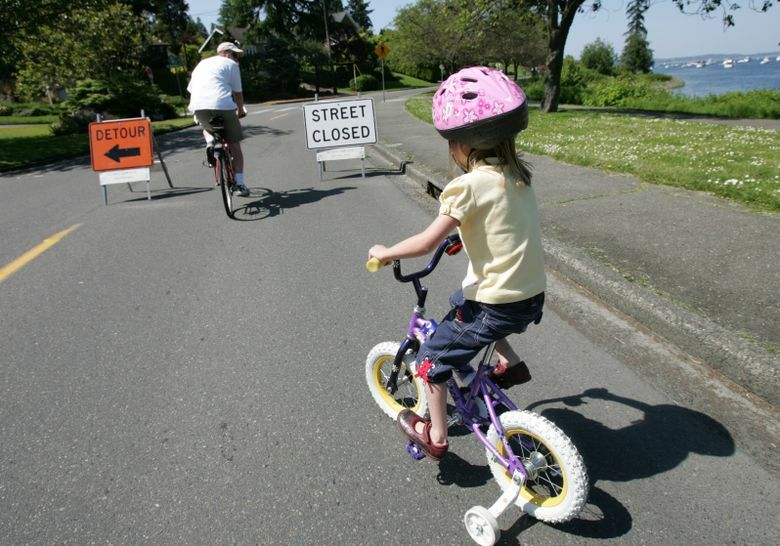 Across Seattle, parklike boulevards beckon the wandering cyclist or family. Tucked along a ravine edge on north Capitol Hill, Interlaken is a gem from another time. Before there were cars in Seattle, there were bikes, and 1.3-mile-long Interlaken Boulevard is the only remaining part of the original Lake Washington Bicycle Path of 1897, which took cyclists from downtown Seattle, along Lake Union, and around Capitol Hill to the big lake. The boulevard’s western edge is near Roanoke Park. The road was “macadamed” — an old style of paving — in 1909 and motorists used it until 1986, when part was closed due to landslides. The bumpy pavement beyond the bollards is degraded, but bikable even in wet weather. At the intersection of Interlaken Drive and Interlaken Boulevard, imagine the “Good Road Lunch Room,” a small cafe that served sandwiches to cyclists making the trek on the path. The exact location is unknown, but thought to have been here, where the drive climbs to the neighborhood streets and connects with 19th Avenue East. The boulevard continues snaking along the ravine to the section that’s closed to cars. At its east edge, you’re two blocks from Lake Washington Boulevard and the Washington Park Arboretum. When you want to top Magnolia, there’s no way around a hill-climb. Autos need to navigate one of three bridges to reach the neighborhood, which makes this one of the city’s quietest street scenes. By bike, however, there are trails approaching from the south and the east that lead to the neighborhood’s eastern edge. The boulevard skirts the south and west sides of the hill. I prefer the climb up Thorndyke Avenue West, a steady, milelong grade from the Dravus Street bridge. Then, heading west on the boulevard’s gentle incline, you’re treated to expansive views of Elliott Bay, skyscrapers and mountains. At the far end of this 2.5-mile road, Discovery Park awaits. Look for the rusty, exfoliating bark of the native Pacific madrona trees clinging to the bluff, which actually gave Magnolia its name, when an early surveyor mistook one type of tree for the other. At a modest 1.5 miles, Ravenna is a great connecting street, linking Green Lake and the University District. There’s one traffic lane each direction, separated by lawn. Enjoy the widest bike lanes in town. Best part: They’re on the left side of the driving lane, not next to the parked cars. Traffic engineers plan to upgrade the street’s major intersections, hopefully including the five-way mess at Green Lake Way, which confounds all users. Stop for refreshments at Cowen Park Grocery on the Brooklyn Avenue North intersection. A park trail connects under 15th Avenue Northeast to Ravenna Park. From Brooklyn Avenue, ride through the park and wooded Ravenna Ravine, with its shady, hard-packed trail. 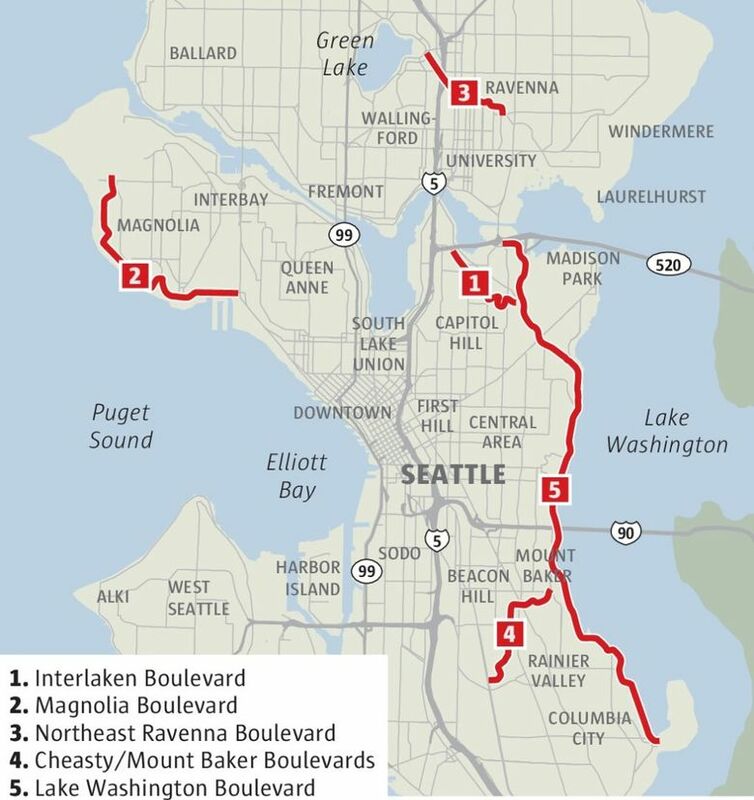 Or continue on the curving boulevard, which narrows so you must take over the lane, down to its connection with Northeast 55th Street near University Village shopping center and the Burke-Gilman Trail. The combination of Cheasty and Mount Baker boulevards is probably the least-traveled of these routes. It takes you from atop Beacon Hill down to Lake Washington. You’ll whoop and whiz down the wooded, curving drive that starts at the south end of Jefferson Park. It drops 1.3 miles, intersecting with Martin Luther King Jr. Way at the Link light rail stop. Navigate the crosswalks or the skinny bike/pedestrian overpass to cross MLK and the adjacent Rainier Avenue South (also on a wish list for a traffic makeover), and connect to Mount Baker Boulevard, an all-too-brief divided road with one-way lanes buffered by a generous green lawn sporting large trees. 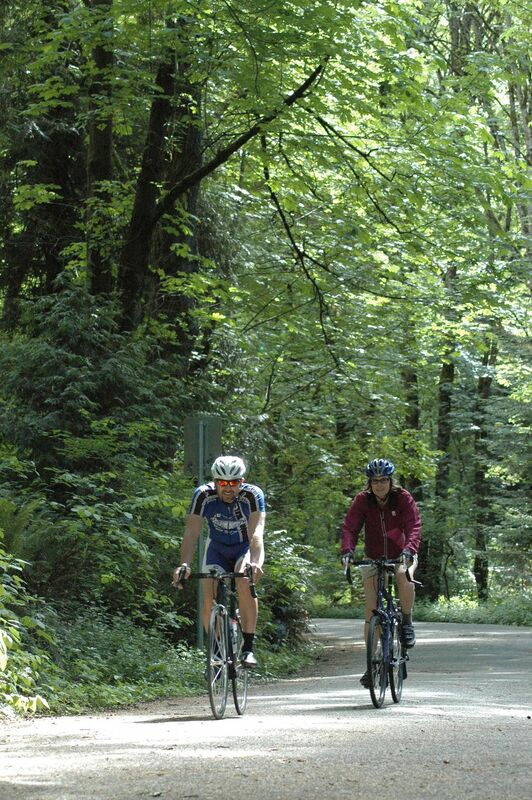 Cyclists cruise along wooded Interlaken Boulevard, near the north end of Seattle’s Capitol Hill. “People congregate on the boulevard,” says Elissa Arnheim, who lives a couple of blocks from the shady lane. “They loiter with their dog, play catch with their kids. It’s where we run into our neighbors.” A nearby tree swing attests. The half-mile road leads to Mount Baker Park; another third of a mile on Lake Park Drive South takes you to Lake Washington Boulevard. Ahh, the long lake road. It was the central jewel in the Olmsted landscape design firm’s “emerald necklace” of parks and boulevards envisioned in a 1903 commission. Shimmering lake, sheltering tree canopy — what more could you want? 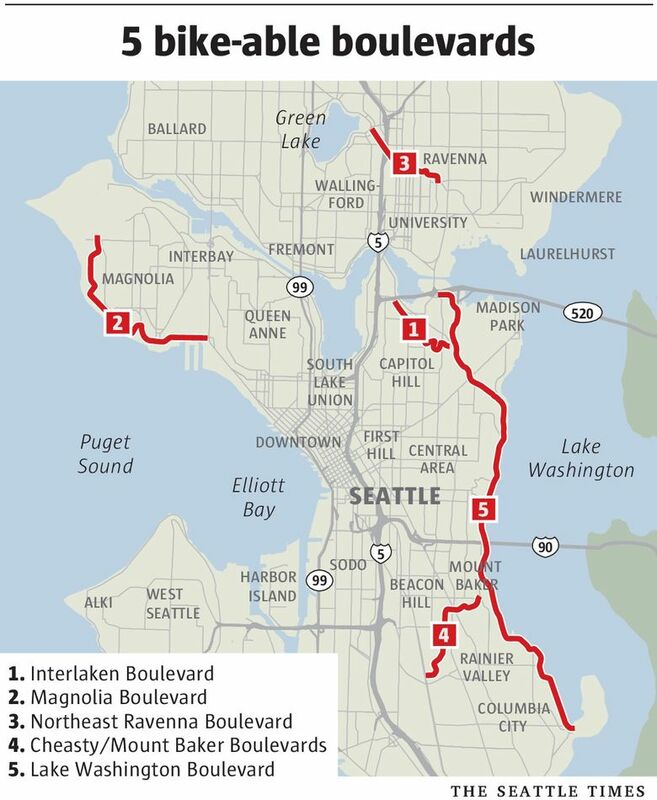 The 8.5-mile drive, mostly along the lake, is by far the longest of Seattle’s boulevards. Turn right from Mount Baker Park and pedal 3.2 miles to Seward Park, which is the road’s south terminus. This section is closed on 12 “Bicycle Sundays” this summer (see ”If You Go”). Or, turn left and head north and you’ll soon find yourself climbing through Colman Park, getting a view east toward Bellevue above the Interstate-90 bridge, then spinning down through Frink and Leschi parks to reach the lake again in 2 miles. The boulevard continues an additional 1.3 miles to Lakeview Park, and then 2 miles through the Washington Park Arboretum area before ending at the Montlake Bridge. Bill Thorness is the author of “Biking Puget Sound: 60 Rides from Olympia to the San Juans.” Its second edition was just released by Mountaineers Books.